According to Opswat, a software development company based in San Francisco, Avast continues to be the world's preferred antivirus. Avast was found on more than 16 percent of computers worldwide. For the past few years, Avast has topped the survey (pdf), but the total number of Avast users has been slowly slipping. Opswat's data was collected via opt-in middleware, software partnerships and its own app removal utility. The sample included over 353,000 data points from systems across the globe. The reports are typically released annually in March. Interestingly, the same top 10 antivirus utilities from last year's report are in the top 10 this year. However, their positions at the top of the list have changed slightly. Most dramatically, Microsoft Security Essentials has jumped from the bottom of that last to fourth place. Avira and AVG placed second and third, respectively. Microsoft's Security Essentials enjoyed a 30 percent jump and showed the largest market share gains of any antivirus security product, topping 10 percent. In North America, Microsoft Security Essentials also enjoys a comfortable lead with just over 14.5 percent. That's about 5.5 percent more than runner-up, Avast, with just over 9 percent of market. 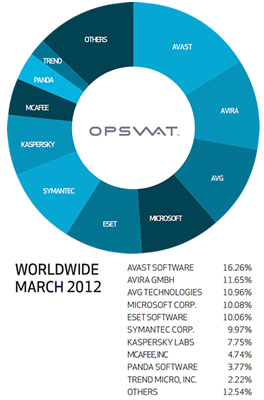 For 2012 thus far, Symantec is tops in North America. Norton products seem to be eeking out dominance by just a couple of percentage points at 16.09 percent. MSSE follows closely behind while AVG places third. P2P programs installed on user's computers were also included in the report. Opswat found that uTorrent was by far the most popular P2P tool on systems with a whopping 36.86 percent market share. The next most popular P2P utility was music-centric Ares, a program which was discovered on 14.79 percent of computers in the report.